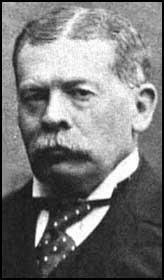 Richard Olney was born in Oxford, Massachusetts, on 15th September, 1835. After graduated from the Harvard Law School he practised in Boston. He was elected to the Massachusetts legislature in 1873 but he became a national figure in 1893 when President Grover Cleveland, appointed him the U.S. attorney general. During the Pullman Strike in 1894 sought an injunction under the Sherman Anti-Trust Act against the American Railway Union. Controversially, Olney sent federal troops to Chicago and shots were fired at the strikers. As a result, of Olney's action, Eugene Debs, president of the union was arrested and despite being defended by Clarence Darrow, was imprisoned. President Grover Cleveland appointed Olney as his secretary of state in June, 1895. Soon afterwards Olney had to deal with a dispute with Britain over the Venezuela-British Guiana boundary. Olney retired from government in 1897 and returned to the private practice of law. Richard Olney died in Boston on 8th April, 1917.